Block off a Saturday and gather your supplies. Before you clean the garage, be sure of what your needs are. Clean out the garage ? move everything to the driveway. Lastly, tactfully bring your things back into the clean garage. Garages get neglected. 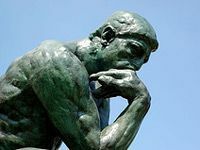 We can barely keep chaos and disorder from infecting the homes we live in, so how can we rationalize spending hours cleaning the garage? Thus, the chore is put off until it’s so bad you must search the Internet for logical ways to attack the problem. Well, you’ve come to the right place. I let my garage slip away. If the situation had worsened, I’m sure my neighbors would have called the police, fearing a meth lab had sprung up next door, or that one had exploded. Going in, I knew that the right strategy would help shave hours off the project and keep my garage clean for more than a week. After ruminating and researching, I found some general principles and tools that all cleaning enthusiasts agree on. Block off a Saturday and gather your supplies. If you’re dealing with an abomination (yes, that’s my garage), garage cleaning is an all-day event. You’ll need a cement broom, work gloves, garbage bags (garbage cans make the job easier on your back), and boxes to bring things to charities. If you don’t already have one, buy a wet/dry vacuum or a Shop Vac. It is the best and most utilized tool I’ve ever purchased. Lastly, you’ll need to find some way to move unwanted things to charities or the dump. Some charities will pick things up if you call ahead. If not, borrow a truck from a friend or rent one. Before you clean the garage, be sure of what your needs are. Garage cleaning is mostly about organization. Your things should be accessible and easy to find. But before you can get organized, you’ll need to decide what your needs are. Here in the North, I need my garage to protect my vehicles during the cold months. I need a place for my tools, lawn and garden supplies, as well as automotive odds and ends. I also need room for a freezer and all of the items my wife believes we will use in the distant future. Purchase organizers. 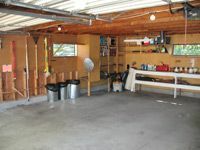 A clean garage is an organized garage. 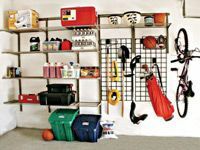 Purchase shelving, peg board, toolboxes, and both wall and ceiling hooks. 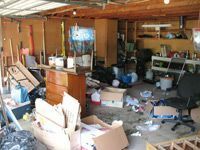 You can do this before or after removing everything from your garage, but it would be quicker to have some things on hand. Peg boards are great for saving space and organizing tools. I use ceiling and wall hooks for rakes, shovels, ladders, and other large space gluttons. Utilize what you have if you can, and be creative. Look for ideas at your local department and hardware stores. 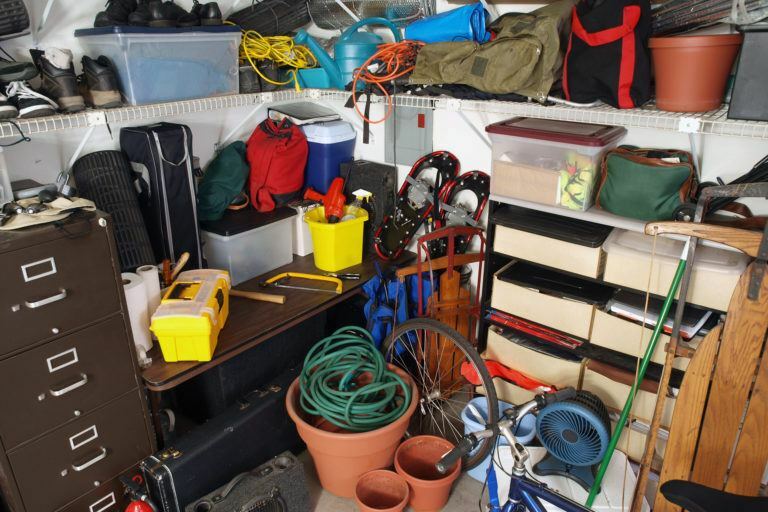 Remember, organization is the only way to keep your garage clean for any significant amount of time. Clean out the garage – move everything to the driveway. 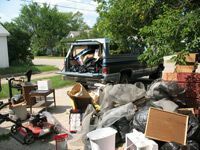 Make space in your driveway for three different categories: (A) Stuff you absolutely will use and should return to the garage (B) Stuff for charities (C) Garbage and recycling. As you can see, my driveway became so unruly no categories are discernable. But there is a method to this madness. Once this is finished, truck unwanted items away or have a charity pick up your offerings. Garage floor cleaning. Now that everything has been moved out of the garage, it’s time to clean the garage floors and walls. How you go about this depends on your funds, what shape the garage is in, and what you’ll be doing in your garage. My floor is ancient – a moonscape of pockmarks and cracks. I used a cement broom (don’t skimp on these) to sweep up dirt and debris, and then a wet/dry vacuum to cover the walls, nooks, cobwebs…etc. Lastly, tactfully bring your things back into the clean garage. If you put things back carelessly, your newly clean garage will be a depressing dumping ground within a few months. Keep similar items together, and make use of organizers. Camping items, sports equipment, tools, chemicals – all categories should have their own place. If you have a family (or a brain like mine), labels are a good idea. There you have it – you have learned how to clean a garage. Good luck and be safe. How to clean garage windows. It’s great to have natural light to work with in the garage. I use traditional methods and tools, and a homemade cleaner. Follow the link to see how to clean windows. How to clean garage doors. Avoid using acidic or abrasive cleaners that could dull the finish. When cleaning garage doors, a gentle approach is often best. Some finishes react badly to certain chemicals. If the doors are relatively new, contact the manufacturer for instructions. Here is a safe way to clean any garage door. 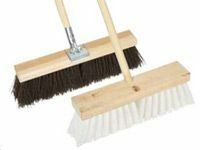 First, use a soft brush or broom to remove loose dirt and debris. Next, mix a bucket of warm water with a small amount of mild detergent. Wash the door with a sponge, and then go over it again with plain water. Let it dry before opening. Lastly, clean the weather stripping. Now would be a good time to lubricate the moving parts – the hinges, the springs, and the tracks. Earth Paint E-Coat Sealer. This is a commercial-grade sealer for concrete floors, masonry, siding, and more. It’s made from acrylic resin with citrus solvent, so it’s environmentally friendly and non-toxic. Peg Board. This stuff is great for organizing and easy to install. Peg board comes in different styles and sizes, with different hooks and organizing accessories. Keeping tools and equipment on the wall is practical – it makes them readily accessible. It also frees up room for your toys and vehicles. Wet/Dry Vac.The silt-like dust that accumulates in a garage resists dust pans. Move it into piles with a concrete broom, but use a vacuum to get it off the garage floor. I also use this vacuum to clean garage walls. Who wants to pull cobwebs from a broom? The vacuum has the power to wrench filth from awkward spaces. It also saved me the horror of killing a menagerie of insects. The giant wolf spider, the angry hornet, the evil-looking exoskeleton – they all disappeared into the vacuum. Bad karma, clean garage. For those of you suffering from memories of dragging a gigantic red vacuum around, fear not. Amazon sells portable ArmorAll wet/dry vacs for a really decent price. Your friends and family. Garage cleaning is a horrible job to tackle by your lonesome. With all the heavy lifting, it probably isn’t that safe either. Do you have any dirt on your neighbors? Can you blackmail or otherwise coerce them into a horrible Saturday? Perhaps you can start a work exchange with some buddies. For your health and sanity, you’ll need some help to clean a garage.